If you followed any of my posts about Advent, I’m sure you recall my mention of a trilogy of Advent storybooks we read each year as a family. The characters in Jotham’s Journey, Tabitha’s Travels, and Bartholomew’s Passage have become well-loved friends over the years as we’ve cycled through these books. 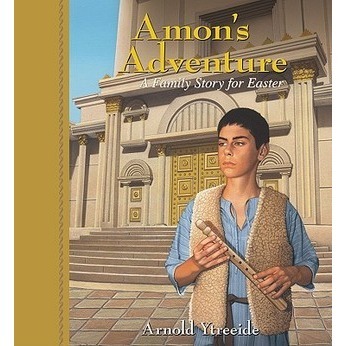 Amon’s Adventure takes place in Jerusalem in the weeks leading up to Passover and Christ’s crucifixion. Amon, the thirteen-year-old son of Jotham and Tabitha, is eager to be recognized as a man in the community. But when his father is wrongly accused of a terrible crime, he finds the role thrust upon him in a way he never imagined! The excitement and suspense build as Amon searches for a way to save Jotham’s life. Along the way, you’ll meet such characters as Gamaliel, Saul of Tarsus, Caiaphas the high priest, Judas Iscariot, and of course, Jesus of Nazareth. Even after two chapters, everyone always begs for more. The story is fast-paced, fascinating, and at times humorous. Each chapter is a cliffhanger, leaving you eager to know what happens next. The devotions are short and to the point. They’ve led to some good discussion for us. In my experience, there are a number of Advent resources and activities to choose from, but I’ve seen little for Lent. I own a couple of things, but nothing that we’ve absolutely loved. We really enjoy our Resurrection Eggs and Benjamin’s Box, the accompanying book, but they’re not meant to be a devotional that covers the entire season. I’m thrilled to have something comparable to our Advent family storybooks for Lent! Yes, I realize this suggestion is a bit belated for most of you to use Amon’s Adventure this year (although you could download the Kindle edition and begin immediately! ), but it’s never too late to begin planning for next year! I have no doubt that Amon’s Adventure will join it’s predecessors as a well-loved yearly tradition for our family. I think this would be an excellent read for your Bible study girls! My only concern would be fitting it all in…how often do you meet? There are 28 readings total, so you’d have to figure out how many chapters to read each time you meet to get through. The suggested schedules are to start on Ash Wednesday, the fifth Saturday before Easter, or Palm Sunday and read every day or two. Hi Kara, Since I wrote to you I sat to consider the schedule too. These are my thoughts. Do you have other recommendations? Perhaps activities we could do with the girls at each discussion? We usually try to tie in a craft of activity to our discussion – hoping we can do this alongside families too – so perhaps family activities – -such as visiting a local temple and attending passover meal. Mon 2/24: Amon’s Adv Setting – Jerusalem at that time; the Temple; Story Characters and their real life counterparts: Gamaliel, Saul, Caiaphas, Judas Iscariot. Perhaps guest spkr? Start Reading after this lesson. Sunday 4/20 EASTER – HE IS RISEN! Mon 4/21: Discuss Chapters 27-28 (pgs 166-191) WHAT is OUR Response to Christ’s amazing sacrifice – given out of purest love and obedience to God? Possible service project this night.